Norris & Stevens, Inc., is pleased to announce that FKR Properties LLC has purchased Stonemill Business Park from StanCorp Real Estate LLC, dba Stonemill Business Park LLC for $15,250,000. The property is a two-building, 117,332 sq. ft. office park built on 9.08 acres located at 204 and 312 S.E. Stonemill Drive, Vancouver, Washington. The park was built in 1986 and was 89 percent occupied at the time of closing. Major tenants include Kaiser Foundation Health Plan, Inc., Pacific Northwest Renal Services LLC, Burns & McDonnell Engineering, State of Washington and Sunsteel. The Standard has held the asset as an investment for nearly 20 years. “We found the perfect buyer for the exit to our investment strategy” commented Mike Morey, vice president and managing director of The Standard. The buyer sold an office project in Mountain View, California, and sought to reinvest the proceeds in two separate properties in Clark County, Washington, via a 1031 Exchange. As exclusive listing agents, Todd VanDomelen, vice president, Investment Properties; Timothy S. Mitchell, president; and Timothy Pfeiffer, senior broker, Office Properties of Norris & Stevens, Inc., represented the seller in the transaction. 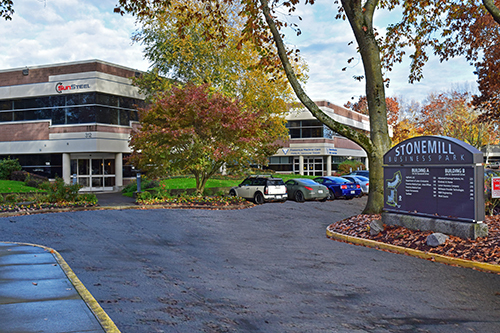 Norris & Stevens, Inc., had professionally leased and managed the property for The Standard and is being retained by FKR to continue both activities. Norris & Stevens, Inc., is one of the largest locally-owned, full-service commercial real estate brokerage firms in Oregon and SW Washington. A member of the TCN Worldwide network, the firm was founded in 1966 and currently employs approximately 75 professionals in investment sales, leasing and property management for office, industrial, retail, land and multi-family properties. The firm’s property management portfolio exceeds 6.5 million square feet of commercial space and over 9,000 apartment units.